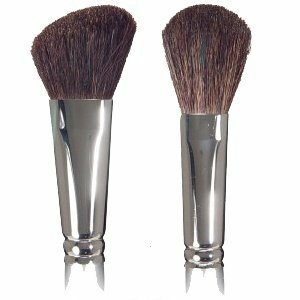 Makeup Brushes have been the essential tool of the makeup artist since the beginning of the profession in the late 1800’s. In fact, the professional makeup artist in Hollywood were not allowed to start their own makeup artist local initially, and the painter’s union accepted makeup artist into their union because they both used brushes. Makeup brushes have undergone some dramatic changes over the years. The first brushes were undoubtedly designed by the Egyptians. One of the oldest makeup brushes in existence dates back to about 600 A.D. and was found in a Saxon Cemetery in England. Today there are millions of brush types, all based on alterations of a few basic designs. The “masters” who created these basic designs created a standard in the industry. Over the last few years many “wanna-be’s” have created (mostly selected from stock inventories) their brush lines based on all the basic designs utilizing an array of brush parts, handle choices, and hair types – most of which do nothing to add to the makeup application but look good on a vanity. There are 3 parts to a brush, the handle, the ferrule, and the bristle. 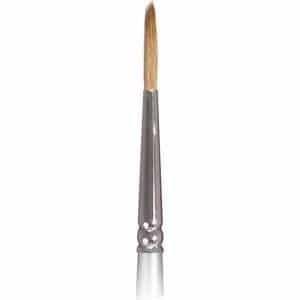 Brush handles are available in wood, plastic, metal, and even glass. The standard over the years has been wood that is coated in varnish or paint. Plastic and acrylic handles are available but are not adequate for the professional because plastic has problems in the attachment of the ferrule as well as problems with solvents used in brush cleaners when exposed to the handle. The ferrule is usually made of metal (e.g. nickel-plated brass; aluminum) and less commonly from plastic. The bristles are held in place by the top of the ferrule, which is sometimes pinched flat, and a good dollop of glue. The bottom of the ferrule is glued to the handle too, so don’t leave your brushes in water or let the ferrule get water in it. Premier quality brushes use an epoxy that is solvent proof in the ferrule to hold bristle better and not be dissolved. Animal hair (sometimes referred to as “natural”) comes from animals, including goats, badgers, squirrels, weasels (“sable”) and horses (“pony”). Camel hair brushes are not actually made from camel hair, but a combination of several types of animal hair (including horse, goat and squirrel), depending on the desired softness and cost. Simply because it has been traditionally used in brushes for a long time and there was no other suitable material until synthetics came along. The hair has a cuticle, a layered outer coating on the hair shaft, which picks up and distributes powder products well. The cuticle also means that animal hair is not so good for cream, gel or liquid products, as it picks up too much product and can lead to clogging, blobs or streaking. Each type of hair comes with its own unique strengths and advantages. For example: sable hair is soft, flexible and goes to a fine point, which is good for precision work; badger hair is stiff and is used in brushes that work to define and shape, like brow brushes; squirrel and goat hair is very soft. Synthetic bristles are made from 100% man-made fibers like nylon and polyester. Synthetic bristles do not have a cuticle, so are very smooth and trap less product in the bristles than animal hair brushes – this makes them great for creams, gels and liquids. Powder can also be applied with synthetics designed specifically for this purpose, e.g. Taklon and Natrafil were created specifically to mimic the different properties of animal hair, making them good substitutes for using with powder cosmetics. Synthetic bristle is manufactured in factories. The hair can be dyed, often to mimic animal hair, like cream or brown. Taklon is a soft, smooth polyester derivative, originally developed by DuPont to mimic the qualities of natural sable (flexible and soft with a good point). It is an incredibly versatile material and can be used in all types and sizes of makeup brushes. Nylon has smooth fibers and is used in makeup brushes that need a degree of firmness to the bristles, like concealer, brow and mascara brushes. Natrafil® is another DuPont creation, initially designed to replace animal hair for use in powder brushes, where being able to pick up the product and release it evenly onto the skin is important. Natrafil® is a polyester-based composite and is made with a textured surface, allowing the hair to grab the powder. 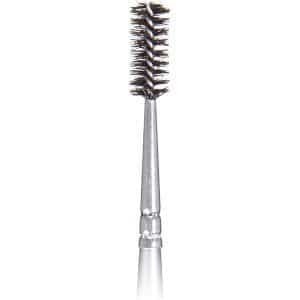 The commonly-held belief that synthetics are no good for powder makeup is no longer so with these type of bristles. Hygiene and Cleaning Smooth fibers used lack a cuticle, making it easier to clean thoroughly. Has an irregular surface (due to cuticles) which traps powders, dead skin cells, bacteria and chemicals. Cleaning may not necessarily remove all these particles. Best Uses Cream, gel and liquid. Powders can also be applied with the textured synthetic bristles. Powder makeup products. Feel on Skin Bristles tend to be firmer, though more flexible versions are available. Bristles can vary from very soft and fluffy to firmer, depending on type of hair used. Durability Stands up to solvents and doesn’t dry out. Keeps shape well. Dries quicker than animal hair after washing. Over time with washing and cleaning, hair is prone to breakage, drying out and can lose its shape. Hair can shed. Ethos Cruelty free. No protein element, so vegan friendly. Animal treatment issues. As professional makeup artists, we use every type of makeup there is, in all situations, and on all sorts of faces – and we have a mixture of natural and 100% synthetic brushes in our kit. The synthetic brush is slowly gaining preference in the industry because of the technical advancements in the ability to imitate natural bristle, as well as, the other advantages we feel that today’s synthetic brushes have over animal hair in terms of reliability, durability and hygiene, we simply cannot ignore the cruelty involved in obtaining hair from animals just to make makeup brushes. Yes, we are biased towards synthetics and don’t like cruelty. The basic style of the brush is determined by the designer. Placing bristle into a specific form or “mount” is done first, then the hand trimming of the bristle is done by artisans who have passed down their art from generation. When the design trimming is finished, the bristle is tied at the base of the form and the transferred (or inserted) into a ferrule. Some construction practices at this point add an epoxy into the base of the ferrule to add additional hold of the bristle in the ferrule and to assist in holding the ferrule to the handle. This is done especially if the ferrule is not crimped. Higher quality, and better designed professional brushes are glued and crimped in the handle and ferrule assembly. 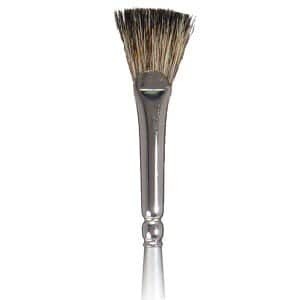 Dome brushes are a trim of a round dome shape on the top of the brush. They are available on a variety of sizes from very large to very small with additional selection of hair lengths from the tip of the ferrule to the top of the bristle. While most larger dome brushes are used for powder brushes, smaller versions are used for the application of dry cheek color and dry blusher to add “color dimension” to the face. 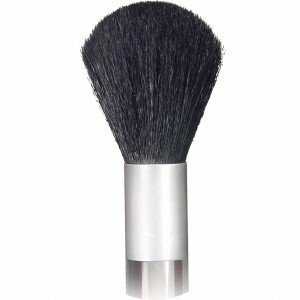 The dome brush is used for removing excess on the body and large areas of the face. It is not an application brush. Blush or check color brushes are used to apply dry rouge or cheek color on the face. The brushes are basically a smaller version of a powder brush. The ideal Blush Brushes are founded filbert cut on an angle brushes (as pictured on the left). Flat brushes are designed in flat forms and inserted into ferrules that are round at the handle and flat at the top of the ferrule. The flat brush comes in a variety of hair lengths and widths but, are all trimmed with flat tips. This flat tip actually offers the ability for 2 uses in 1 brush. The large flat side and the smaller flat side. This varies on the size of the brush. Flat brushes are available in widths of 1/32 inch wide to 2” wide. Anything larger would not be advisable for professional use on a regular basis. Flat brushes of professional quality are trimmed like a sharp wedge. Flat brushes can be used for a variety of application uses. They are great for all cream and liquid products. The larger the application area the larger of the brush to use. Very small flat brushes can be used for eye liner. Round brushes are the oldest of all brushes. They were used by calligraphers in Japan and China over 2000 years ago. Today round brushes are made by trimming a round cylindrical shape into a variety of points. They come in a variety of sizes and are useful in fine detail. 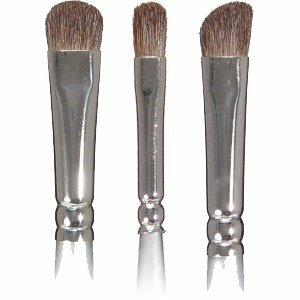 Round brushes are best used for cream and liquid based products. 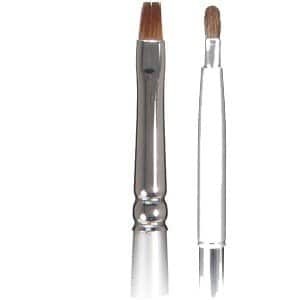 Smaller round brushes are excellent as eye lining brushes. Some companies design smaller round brushes with longer bristle premier eyeliners using cake of liquid eye lining products. Larger round brushes are used in character makeups, and makeup special effects where the attention to detail is needed. Round brushes (natural fiber is better) tend to hold more products and is easily delivered to the makeup design in a constant flow. 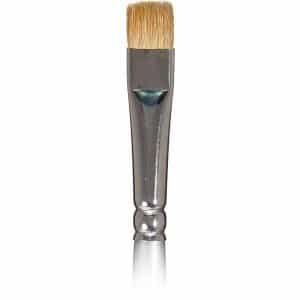 Filbert brushes are a mix of a dome shaped tip, a flat design. It is a flat brush trimmed to a graduating long flat point on the long and short side of the brush. Originally designed so the brush would leave a smudged line on each side of the brush, it is used as an excellent eye shadow brush and concealer brush It is also available in sizes from .25-inch widths to 2-inch widths. Filbert brushes can be used for cream and liquid products. Because they easily deliver product to the makeup design as well as the application, they also leave a soft edge to the face. They make excellent foundation application brushes and can even be used for eye colors and eye shading. The size is dependent on the area of application. 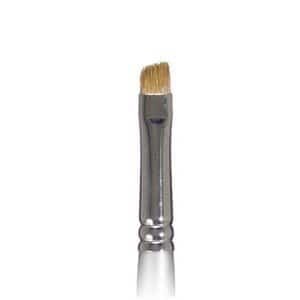 Angle brushes are flat brushes but the tip of the brush is trimmed at an angle. The angle design as developed due to the angle of application (the angle the brush is held in the hand) perfectly is aligned at a perfect perpendicular angle to the application area. The angle brush was developed in the mid 1960’s and was one of the first proprietary designs made by makeup artists’. The angle brush can be used for a variety of applications. Depending on the size (width) of the angle brush, it can be used for lip liner, eye liner, and detailed accents like individual hairs to fill in sparse areas in a mustache, beard, or eye brows. Larger angle brushes can be used for larger application areas like darker eye shadows in the crease of the eyes for smoky eye effects., Angle brushes are used in character makeups and makeup special effects. Fluff Brushes are probably the contain the largest array of designs. Most all fluff brushes are designed for dry products like eye colors, eye shadows, highlight, shading, and contour colors. The “fluffy” design of the brush is not only used for application but is also used for blending either into the skin tone or from dry product to another (in the application of multiple eye colors and shadows). Fluff brushes are not necessarily used for cream or liquid products. Their rounded tip makes it very easy to blend color together. Larger fluffs also can be used for the application of contour under the check however most makeup artist that use a fluff for this application will usually use a larger fluff type design (blush brush) to blend the cheek color and contour color. Lip Brushes are specifically engineered so the bristle is a little longer from the top of the ferrule to the tip of the brush. The allows cream lip stick to utilize the length of the brush bristle to glide and smoothly apply the color. The tops of most all good lip brushes are flat or filbert shaped. Using a narrow width flat brush or filbert brush does not allow for a smooth and equal application of product due to the “spring” of the brush. The longer the bristle, the less spring. You do not need a lot of spring on a lip brush as opposed to a brush used for a heavier based product like a cream foundation. 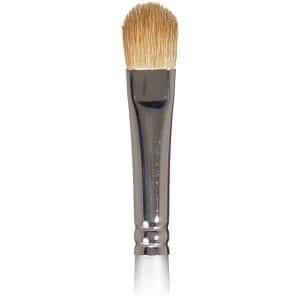 Most makeup professional prefer natural bristle lip brushes to synthetic bristle lip brushes. The Ultamatte Eye Magic Brush was designed and developed by Joe Blasco to be used with Joe Blasco Cosmetics Ultamatte Eye Magic. This is a uniquely designed brush that specifically uses “spring” of the bristle, thickness of the brush bristle, and a special angle shape to allow the perfect application of a specific advanced product. This brush can be used not only for the application and use of Ultamatte Eye Color but makes an excellent brush to add extremely small hair-like marks to eyebrows, mustaches and beard lines. The Eye and brow groomer many brushes in 1 brush. They can be purchased individually as separate brushes but are more convenient when they are manufactured as one brush. The comb part of the brush can be used to come eye brows, mustaches and even separate eye lashes. 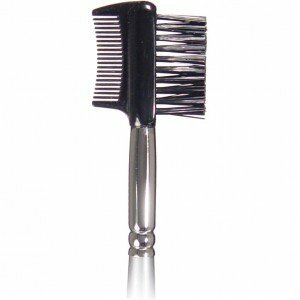 The brush part can be used for the same uses but is primarily used to combing or brushing eyebrows and styling. The brush part of the combination is plastic and the bristle are inexpensive nylon fiber so sterilizing the brush can be difficult if you use hazardous brush cleaners. These brushes are also available as disposables as well. Additionally, the brush part was invented my Maybelline in the very early 1900’s and was the first brush to be used for a new product (at that time) called cake mascara. The Spoolie is a basic (old style) mascara brush affixed to a handle. The handles come in wood, plastic and acrylic. Plastic handle Spoolie (disposables)z as well as wooden and acrylic handle Spoolies can be used for a variety of utility uses. Some people use the Spoolie to apply mascara, other use a clean Spoolie to separate eye lashes after the mascara application. Often makeup professional will bend the Spoolie at the top of the ferrule to a 45-degree angle and use it to brush eyebrows. This alteration or bending of the design actually makes the Spoolie easier to get-to difficult places on the face. Because of the spiraling-twisted bristle it is difficult to clean the Spoolie and disposable Spoolies should be used once and discarded. The Crease Blender is a combination of a round brush with a circular trim similar to a filbert cut. The brush comes in several sizes and diameters. It is designed to place an eye shadow (darker dry shadow to be applied in the crease of the eye. Some professions use smaller Crease Blender to “dot” color into the crease and use a larger Crease Blender to blend the color into the skin or another eye color. The Crease Blender is a very dense brush with very little spring to the brush. This trait makes the Crease Blender an excellent blending brush. Some makeup professions use the Crease Blender to smudge eye liner (pencil, Gel, or cake types) on the eye lids. The fan brush comes in a variety of sizes. Some of them have longer and wider widths, others have shorter (with more spring) and a smaller width. Large Fan Brushes can be used for the removal of loose powder after powdering the face with a powder puff. Smaller Fan Brushes have more spring and were initially developed in the early 1940’s to be used as an alternative to applying mascara to the eye lashes with the old-style mascara brush. Professionals use the Fan Brush, dipped into loose powder to remove flakes of eyeshadow and mascara that fall on the upper cheek. One needs only to look on the internet for brush kits only to find an overwhelming choice of brush kits ranging from $15.00 upward. Understanding what you are looking for is a key to selecting a good kit combined with a basic knowledge of brush assembly and design. Some key advise is listed below. Stay away from brush kits that include mega amounts of brushes and are sold at a low price. Recently, I saw a brush kit that included 42 brushes that sold for $15.00. Do you honestly think these brushes have any qualification for quality? That comes down to about $0.35 per brush! No way they can be anything other than cheap imitations – These brushes (if animal hair) could be illegal hair (dog mainly). They cannot be used in professional brush solvents. Their only usage is, “use once and throw away because the unit price for each brush is less than its counterpart disposable. For first timers select a kit with a price range of about $80 to $100 for about 20 brushes. The brushes should be in a nice case that wraps with bands – do not select a case with snaps, snaps break. The selection of brushes should be a couple each of every main category above along with a selection of utility brushes. The handles should be wood, the ferules should be metal, and the bristle should be glued into the ferrule with an epoxy and double crimped. Do not use brushes that have glued ferules to the wood handles – they will come apart. Look at the hair. If the set is marketed as an animal cruelty free set, then it will include only synthetic bristle brushes. Do not just feel the powder brush and say, “Oh that is so soft”, and assume the softness is a qualification for a good brush. Each design should have a particular bristle balanced with a trim that offers the correct amount of “spring” to get the job done easily and effectively. Contains 19 excellent quality brushes all with Natrafil® DuPont Fibers that react to the spring and design of each brush. 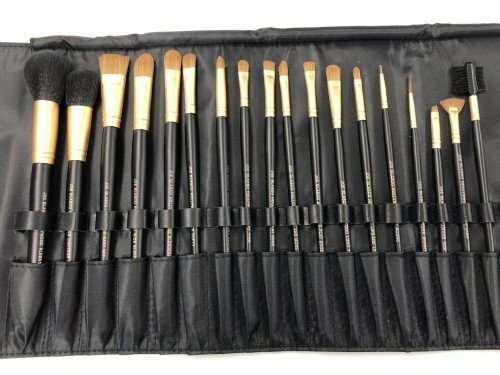 Each brush was developed by Joe Blasco personally, and is the best premier brush set on the market It is very reasonably priced and includes the following brushes in a wrap-around leatherette protective holder. While cleaning brushes is not necessarily associated with the selection and quality of your brushes; premier brushes must be kept clean and sanitary between each use and during storage. Use a Brush Cleaner that is developed to clean brushes. It must be strong enough to clean a the outside and penetrate inside the brush without destroying the handle and ferrule while being formulated with a raw material that conditions the brush. Most scents are an oil base and will actually condition the brush. Stay away from cleaners that leave an oily film on your brush. A good test is to put a couple of drops on your finger and rub your fingers together – if it feels oily, don not use it! cleaning sprays do not accomplish this important part of cleaning and sterilizing your brush. And finally, a good brush cleaner will dry quickly. 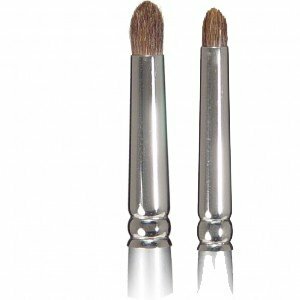 Almost instantly for smaller brushes and within 3 to 4 minutes for powder type brushes. Pour a small amount of Brush Cleaner into a glass bowl or metal tin. Place the tip directly into the Brush Cleaner only to the ferrule – do not immerse the entire brush into the container of brush cleaner. Do not “jab” the brush on to the bottom of the container of brush cleaner – just “dip the tip”. Pull the brush out of the brush cleaner and wipe the brush against the towel in a few strokes. Do not destroy the bristle design. Continue dipping the tip into the brush cleaner and repeating the process, until the residue on the towel is clear. When the brush is clean, use your clean fingers to reshape the brush so the it will dry (quickly) in form. Note: Powder Brushes, Blush Brushes, and these types of brushes will take a few more “dip and tips” and it will require some additional drying time. Yes, even makeup professionals take time-off. If you are taking some extended time away from your brushes (like 6 months or longer) treat your brushes in a 50% solution of distilled water and 50% liquid starch. Dip the brush into the solution. Pull the brush out, and with clean fingers, re-shape the brush into the proper form. This will protect your brushes from unnecessary dry-outs and keep the form true in storage. When you are ready to use your brushes, just follow the steps in How to Clean your Brushes.